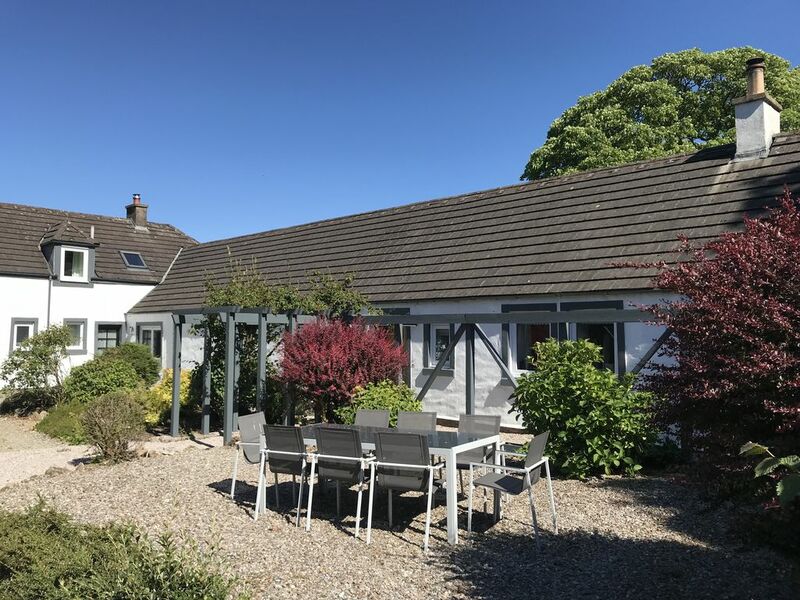 Ross Cottage is one of the Dunmore Cottages on 120 acres of peace and tranquillity on the shores of West Loch Tarbert in South Knapdale, just seven miles from the fishing village of Tarbert on Loch Fyne. The new owners purchased Dunmore House and Cottages in 2015/16 which sits on a beautiful estate with stunning views over West Loch Tarbert. They have an exciting vision for Dunmore over the coming years, which includes the full renovation of the self-catering cottages. Their aim is to create a fabulous destination on the West Coast of Scotland providing excellent facilities with a homely feel. The good news is that they have already commenced the renovation of the cottages. Ross Cottage is a luxury 4 Star traditional stone cottage all on one level, which has recently been renovated to a very high standard. Visit Scotland has awarded Ross Cottage 4 stars. The Cottage comprises two en suite bedrooms with underfloor heating in the en suite's. The Blue Bedroom has a walk-in shower and large bath. The white bedroom has a walk-in shower en suite. Both bedrooms have king size beds. The kitchen and dining room are fully equipped to the highest standard including dishwasher and Nespresso coffee machine. A 60" curved screen TV is in the living room with views out through the trees to the West Loch. In the courtyard there is an outdoor table, chairs and gas BBQ available for your use whilst staying at the cottage. Dunmore Cottages are a perfect vacation retreat either to relax by the open wood fires or enjoy the many outdoor activities that are available. Located on the shores of West Loch Tarbert, and only 7 miles from the picturesque fishing village of Tarbert, guests can enjoy the many hiking trails, and abundant wildlife, take a trip to the nearby Loch Stornoway sandy beach or further afield to the lovely 6 mile long Westport beach, sample the excellent area restaurants (the award winning Kilberry Inn is only 8 miles away), visit the inner Hebridean Islands of Islay and Jura, whisky tasting at the numerous distilleries, visit the historic Kilmartin Glen, walk the beautiful gardens on the Isle of Gigha or Brodick Castle on the Island of Arran. Dunmore self catering cottages are very popular for family get togethers and are ideal for children with a large play area. Ross Cottage is dog free. Dogs are welcome in Fraser Cottage. The cottages are available year round. Lettings are from Saturday to Saturday in May, June, August, Easter, Christmas and New Year; outwith these minimum 3 night short breaks are available but always ask for availability by contacting Amanda either by message, email or telephone. Prices are inclusive of accommodation, linens, electricity and logs for the fire. Both en-suites have walk-in showers with Mira Power Showers, vanity unit, towel rail and underfloor heating. Wood burning stove, logs and peat are supplied. More than four guests? Then why not rent our Fraser Cottage as well, a two bedroom cottage with luxury en-suite, which is a stone's throw away. The cottage really was fabulous with everything you could wish for. It was furnished to a very high standard with high quality lovely furnishings. The view from the kitchen window was lovely and it was so peaceful. There was plenty of space for our 4 year old daughter to run around and explore and you can walk to the Lochside from the house provided you’re prepared for no pathways which was all part of the fun !! The house is about 8 miles from Tarbert where there are some lovely seafood restaurants. Would definitely highly recommend. The cottage is very well and very tastefully equipped. We had a lovely time! Dunmore Cottages are situated along the B8024, eight miles from the fishing village of Tarbert, Loch Fyne. Head South out of Tarbert on the A83 for one mile then take the right turn, sign posted Kilberry B8024, at the golf course turn left, signed Kilberry B8024 and continue along this road, past Torinturk, after approx. 2 miles you will come around a sharp bend to the right and you will see a sign Dunmore Cottages on the right, please turn in here. After the grey gate you will see Campbell Cottage on your right then an alley way, if you walk down here Ross Cottage is across the Courtyard to the right. The nearest petrol station is at Lochgilphead, about 20 miles before you get to Tarbert, or twenty minutes South of Tarbert at the village of Clachan. PLEASE NOTE TARBERT DOES NOT HAVE A PETROL STATION. Lettings in May, June, July & August, Easter, Chrismas & New Year are a minimum 7 days. Three night breaks are available at other times of the year, please always ask for details.